My wife caught this one while we were watching the most recent episode of Pushing Daisies (Corpsicle). 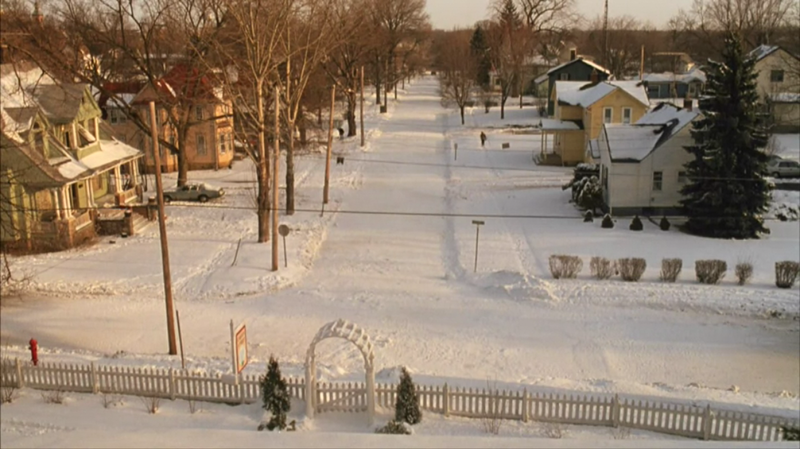 If you forward into the episode, the scene after the commercial break starts out with a Winter scene of a street. When Karen saw this she said “That’s the same street from Groundhog Day”. Upon further investigation it wasn’t just the street, it was the exact scene from Groundhog Day. There is someone shoveling snow on the left side of the street and someone walking down the sidewalk on the right side of the street. The Pushing Daisies scene has the walker just past the yellow house while the Groundhog Day scene has the walker at the end of the block farther away. At 28 minutes 10 seconds (without commercials) the image below was captured from the 2007 Pushing Daisies episode Corpsicle. The clip doesn’t have any relevance to the show except for the snow. At 1 hour 36 minutes and 05 Seconds the image below was captured from the 1993 movie Groundhog Day. This clip is in front of the actual Bed and Breakfast used in the Movie. I wonder how many other people noticed? Pushing Daisies Forum Post. This entry was posted in Television and tagged Pushing Daisies on December 12, 2007 by Rob Jones. Digby is Ned’s dog and the first living thing Ned ever brought back to life. Ned at the age of 9 years, 27 weeks, 6 days and 3 minutes old learned that touching something dead once equals life, touch it again and it’s back to being dead. Ned was fortunate to have learned this before touching Digby a second time. Therefore Digby is alive and well in Ned’s adult life now 19 years, 34 weeks, 1 day, 59 minutes later. He just can’t touch him. The plot of the show is based around Ned’s love for someone he made alive again. That someone is Chuck and they can never touch. Or can they? My first theory is that at the end of season one Digby and Ned will touch accidentally but Digby will not die (Season One Cliffhanger). The end of season one will put Ned and Digby at over 20 years from the first touch. This will lead Ned to wonder how long after he touches something can he touch it again and it not return to being dead. Wanting to know how long before he and Chuck can touch again he will probably setup an experiment with many dead insects, choosing those with the longest life span. Using predetermined times to touch the insects again, after an hour, a day, a week and a year bringing us all the way to the end of the second season (Season Two Cliffhanger). Is 20 years the magic number? Will it be 20 years before Ned and Chuck can touch? My second theory is based on Digby being a Golden Retriever. The average lifespan of a Golden Retriever is 13 years. Digby was 3 years, 2 weeks, 6 days, 5 hours and 9 minutes old when he died so today he would be over 22 years old. That leads us to the conclusion that Ned’s first touch of life alters the natural life span of whatever he touched. This could lead Ned into another experiment. Only this time Ned gathers some insects with very short lifespans. After touching them and bringing them back to life he waits to see how much longer they live past their natural lifespan. This entry was posted in Predictions, Television and tagged Pushing Daisies on October 24, 2007 by Rob Jones.